Pain in shoulder blade can be caused by overuse, wrong posture and many others. It will usually go away on its own, or you can try remedies to help. Your shoulder blade, or scapula, is the triangular-shaped bone at the back of your shoulder. Pain in this area can be quite common and is usually related to physical activity. Understanding the various causes of pain in shoulder blade can help you figure out how to treat it, and help you determine whether it is serious enough to warrant a visit to the doctor. The following are some of the most common causes of pain in your shoulder blade. Keep in mind that occasional scapular pain is a common problem that usually resolves within a day or so. However, unrelenting pain can mean a sign of something more serious. Overuse of shoulder muscles. Almost everyone suffers from this at some point. Using the shoulder muscles too vigorously or too much can lead to muscle strain, and that leads to pain. That pain eventually radiates to the shoulder blade. Activities that require repetitive motion, such as tennis or golf, can lead to this problem. Sleeping the "wrong way." Have you ever woken up with unexplained shoulder pain? This could be because of the way you slept. Sleeping on one side for prolonged periods of time or sleeping your head at an odd angle can lead to this problem. Broken scapula. Often a result of an accident or sports injury, this is a very serious issue that can cause intense pain, especially upon moving. The area might also be swollen or discolored. Shingles. A lingering problem left behind by the chicken pox virus, shingles can lie dormant in the body for years and then suddenly show up, causing pain and discomfort everywhere. The initial sign of shingles is burning pain in your shoulder blade, usually on the right side. It then turns into a rash and can be accompanied by flu-like symptoms, headaches and fever. Osteoarthritis. The hallmark of arthritis is painful, tender joints. Without cartilage there to prevent the bones at the joint from rubbing together, pain can result. Arthritis in the shoulder is rare, but it is definitely a possibility if you have long-term shoulder blade pain. Nerve impingement. If you are dealing with pain in your shoulder that radiates down your arm, you might have a nerve injury. A damaged or pinched nerve in your shoulder or neck can cause intense scapular pain. You might also feel a burning sensation in your fingers or hands. This kind of pain usually lasts for weeks or months, and might not resolve at all without medical treatment. 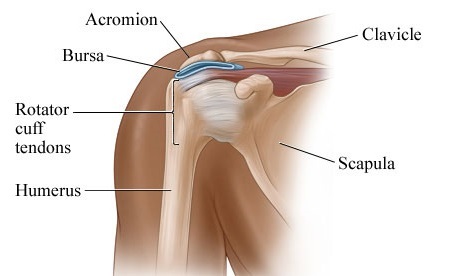 Rotator cuff injury. A common injury among athletes, this refers to an injury of one or more of the four muscles that make up the rotator cuff, an area in the shoulder. When one of these is injured, the pain can manifest in the shoulder blade. Myofascial pain. If your pain is centered below the right shoulder blade, it could be myofascial. This means that a problem with the tissues that cover the muscles is causing pain. Since the pain is often "referred" - meaning that it originates somewhere else - it can be tough to figure out where the pain is actually coming from. Stop activity and rest. Sometimes all you need to combat pain is to take some time and let the area heal. If your pain is caused by repetitive motion or other muscle injury, simply letting the area heal will bring about relief. Rest the area as much as you can, and turn to heat and cold packs if that helps. Keep proper posture. Improper posture can lead to serious aches and pains. If you have problems with posture, make sure to straighten up as much as you can and see if that helps the shoulder pain. This also applies to sleeping the "right way" at night. Use a pillow to keep your head and shoulders aligned, and try to sleep on your back if sleeping on your side seems to exacerbate the pain. Practice scapular retraction exercises. Proper exercises can help you overcome the discomfort and get on the road to healing. Many exercises result in stretching the area, which aids in flexibility, and most can be done anywhere. For example: lift your arms straight in front of you, holding at shoulder level. Then round your shoulders, as though you were trying to hug someone right in front of you. Feel the muscles between your shoulder blades tense? Hold that position for eight or ten seconds, then let go. Learn about massaging techniques. Massage can offer significant relief to any issues involving muscle pain, including scapular pain. Speak with a physical therapist or chiropractor to ensure that you are targeting the right areas. Many people see quick relief after a few massage sessions. Take medications. Over the counter medications can help reduce the pain of a scapular injury. For more intense pain, muscle relaxants and stronger medications, such as steroids, can be prescribed by your physician. Treat potential illnesses. If the shoulder blade pain is caused by arthritis, shingles or some other ailment, your doctor can prescribe medications, exercises and the like to help combat the issue. If the problem is a pressed nerve or a fracture, more serious medical intervention might be required. What Causes Left Side Head Pain? How to Help?